Seventeen of the 21 Montecito residents who perished in the January 9 mudslides lived in an evacuation warning area, not a mandatory evacuation zone. The two people who remain missing and feared dead ― 17-year-old Jack Cantin and 2-year-old Lydia Sutthithepa ― also lived in the warning area. Only four victims lived in the mandatory zone. The east-west line of Highway 192 bisected the community into two distinct emergency notice regions, with evacuation orders issued north of the boundary and warning notices made below the highway. The 7,000 residents in the mandatory zone were told Sunday, January 7, two days before the storm hit, to leave their homes immediately. Sheriff’s deputies went door-to-door Monday to repeat the order. By contrast, the 23,000 people in the warning area were advised to pack their bags and load their cars, and be ready to flee at a moment’s notice. But by the time emergency alerts went out on the night of the storm ― one at 2:46 a.m. targeting Montecito residents registered with the county’s Aware & Prepare program, and another at 3:51 a.m. to all county residents ― it was too late for many to escape the trains of mud and rock that came crashing through their neighborhoods. The evacuation zones were originally developed after the 2009 Jesusita Fire when the Sheriff’s Office, which is responsible for drawing and enforcing emergency-time boundaries, determined it needed a fast way to select easily identifiable areas and the intersections required to keep them closed. “The 192 is the only straight east-west arterial that there was,” said Sheriff Bill Brown in an interview last week. 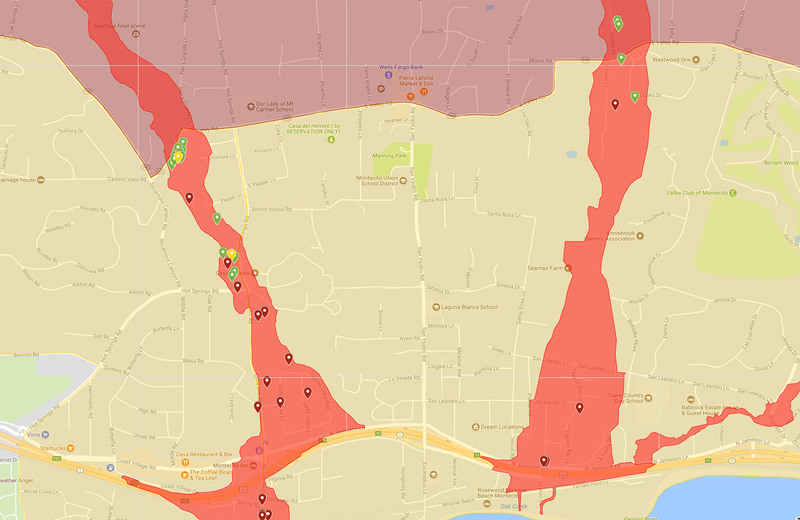 “Everything else was a winding spaghetti of neighborhood streets.” The county had never before conducted an evacuation in response to a flood threat, and the zones were not drawn to follow the downstream flow of creek channels. A fire crew enters a home that suffered substantial damage when Montecito Creek veered to the west before crossing over East Mountain Drive, cutting a new path near Sycamore Canyon Road. By the end, Montecito received about 3.3 inches of rain. Of that, a half-inch fell within five minutes, letting loose the dirt and sending boulders down-canyon. According to county records, it was a once-in-200-years event. During a press conference this Sunday, January 21, Brown said only six people lived in the warning area, while 11 lived “right on the border.” The debris flow devastation that ran downhill and blasted through the 192 was concentrated along Montecito, San Ysidro, and Romero creeks, with Montecito Creek hit hardest. Some of the victims’ bodies were swept more than a mile from their homes. In the days following the disaster, Brown dismissed questions about the adequacy of the evacuation orders. He said trying to identify where in the evacuation zones victims lived and where the majority of the damage was concentrated was “splitting hairs” and a disservice to first responders. Brown had also previously stated that a “vast majority” of victims originated in the mandatory evacuation zone before clarifying that most residents either lived in the mandatory area or just below the Highway 192 border.